Ok so 4 weeks ago all of my classes (I have 3 communication skills classes) started reading Mr. Popper's Penguins and I assigned every student a specific penguin that they had to research. Their penguin had to be life size and the penguin had to represent everything that they researched. Well today was the due date and boy was I a happy camper when the penguins started rolling in about 7:30. By 7:55 I had 76 fabulous penguins in my classroom. When I gave them their assignment I told them to be creative...the only rule was that it had to be life size. Sure I gave them some ideas, but I never expected this. I had penguins carved out of wood, paper mache, flip flops used a arms, a motorized penguin that could move his arm, clay penguins...you name it I've got it. I am so proud of my kids. What a great opportunity for them to spend some quality time with their parents. I just wanted to post some penguin pics so all of you could see how rewarding teaching really is. I am in penguin heaven! Taken from Romans 12:10 "Love each other with geniue affection, and take delight in honoring each other." 1 Thessalonians 5-16-18 "Always be joyful. Keep on praying. No matter what happens, always be thankful, for this is God's will for you who belong to Christ Jesus." What a true testament this is... even though things are sometimes tough for me I know I must always remain thankful because God has a plan and Walt and I are living our lives according to the way the Lord would want us too. God is with us and this is a refreshing and wonderful satisfaction. The Lord is good and so is my life! I guess the past two years I have found myself getting sucked in because Walt is always overseas in January. But seriously... I don't know what it is but I LOVE watching the auditions. Maybe it's because I can't believe some of these people would seriously stand in line for hours upon end to try out when who on God's green earth would ever think they were any good?!? I would NEVER encourage any of my friends to try out if I knew that in all honesty they had no singing voice whatsoever. What type of friend are you? I must say after just two weeks, or 3 episodes I have already picked out some of my favorites that I hope to see in the top. I am an addict though and I am proud to say it. Me: "Walt... you would not like it if I showed up at your work with sweatpants on and no makeup. You would ask me what in the world I was doing." Me: "So, sweetie (no, I probably didn't use the term sweetie) I don't like it when I get pictures of Flat Stanley and you can't see him, or all you can see is your arm. These are going up at the school and everyone knows my husband was the one taking the pictures." Walt: "Ok, I promise I will do a better job. I'm sorry." And that is how every husband is supposed to respond. I've done my job...I've trained him well. Haha.. just kidding.. he loves me and I know it. How lucky I am to have such a devoted, caring, amazing husband. I am truly blessed... although he could work on those camera taking skills. Oh yes.. there is the arm.. you can tell Walt took this picture.. it's all arm. "that's a keeper." I can't actually believe they asked someone to take their picture with the Stanley's...I will give them some credit. Several people have asked me that question since they have found out I am having ten 14&15 year olds over to spend the night tonight. It's our 2nd annual pom party. I think it will be fun... we will veg out, play games, I will get to hear all the latest gossip around Owasso High School and we will bond together as a team...crazy? I think not! Tonight should be a fun night... I've made the chicken spaghetti, Caesar salad, cookies, got the dip ready, and the parents are bringing the rest! When I checked out at Target they asked me if I was having a party, or feeding an army. For those of you that have ever come to visit...you know I like to go overboard! Walt finally made it to Darwin, Australia. He now has a computer and I was told I should be receiving pictures Monday! 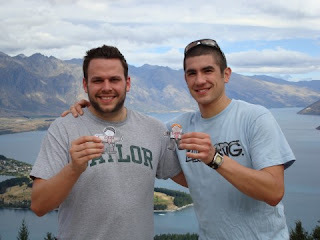 Look back then for posted pictures of Walter, Brett and Flat Stanley! One week down... 4 more to go! I honestly don't know what I will do when Walt is done with this portion of his job. Having him home and never traveling away from me....sounds almost perfect. As for now, I just have to wait patiently for this year to pass by. Ok...I'll admit it.. I never thought I would actually do it, but after some convincing, tonight was my first time, and I actually liked it! 1. You shouldn't put tupperware in the microwave. If you get that white, crusty film around the middle of your tupperware bowl, (or orange if you used pasta sauce) you didn't buy the real expensive tupperware and you shouldn't have put it in the microwave. Technically, you are eating tupperware. Harmless...it will just give you some "roughage." 2. Tupperware is CUTE! Oh my goodness I never thought anyone could have cute, stylish tupperware. I was so tempted to buy the pink and brown striped tupperware set, BUT I held back...I promised myself if I was ever invited to another party, I would buy something. 3. Tupperware has numbers on the bottom...so that you can coordinate all of them according to their height. So, if you were rearranging things and wanted everything to be even... look on the bottom! I think I graduated tonight from Pre-tupperware school and I am now entering the "elementary" phase. I picked up a fundraising brochure. I figured that my pom squad could do some fundraising. 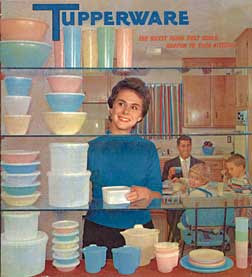 Hopefully I will get invited back to another tupperware party... or I could do the unthinkable.... I could even host my own tupperware party.... it's something to think about. He made it! 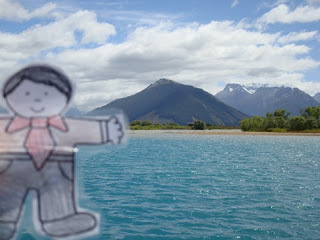 Walt called me on Saturday morning our time... Sunday afternoon New Zealand time to let me know that he, Flat Stanley and Brett made it safely. Oh the joys of marrying a teacher...my class read Flat Stanley and we did a huge letter writing project on it. (Flat Stanley is a story about a boy that was flattened by a bulletin board and he was sent to California in an envelope.) Well, my students sent out letters to their 3 favorite people hoping that they would take pictures with Flat Stanley and send them back to us so we could map out where all Flat Stanley has been. One of my students decided to send Walt a Flat Stanley. Actually, it was addressed to Mr. Bass...and Mr. Bass took Flat Stanley to New Zealand and Australia. He's been taking plenty of pictures with him, and I promise you I will post them when he emails them to me. 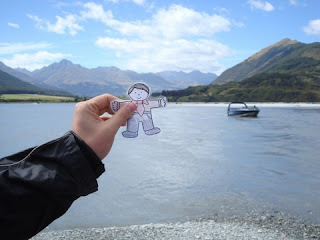 I was even told that Flat Stanley went on the wine tasting tour with Walt and Brett Sunday night....sounds pretty interesting to me. Walt is 16 hours ahead of us, so it is difficult for us to speak everyday because of the time. 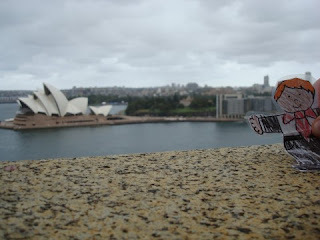 He will actually start his audit on Thursday, so right now he is enjoying some time sight seeing with his close friend and fellow auditor Brett. 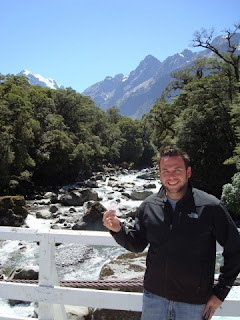 I know I should be getting some pictures soon on what New Zealand looks like, so I will post those. The fact that that song came on my ipod shuffle the exact moment that I got into my car and started my drive home really put me at ease....This is the longest audit that Walt has ever been on, and although we have been away from each other for 4 weeks at a time..this 5 week stint will actually be the longest. It's gonna be a long 5 weeks...but hey...he's living out his dream right? Since Walt is gone, living out his dream....I have enrolled in a running class with my favorite partner in crime from school. Emily and I start training for a half marathon on Wednesday. We are supposed to run our half marathon in April.... and I know that since I have a partner now I will accomplish this task! I knew that I needed to keep myself busy with Walt gone and what better way to spend some time with my favorite kindergarten teacher? Well... The "Wilson Clan" is officially starting to dwindle. I could have guessed that was going to happen because my mother DID have 3 girls and only 1 boy. As of now 2 of us are no longer Wilson's...we have 2 left. Technically we will always have 1 left because he is the boy right? Spencer got married this weekend and added another "Wilson" to the group. Poco seems to be the only one left, but I have a strange feeling she will be moving out of the "Wilson Clan" in the near future. So.. Spencer added Lauren, but the 3 "original Wilson" girls will soon all be gone. Let's take a moment to observe this picture in memory of the "Original Wilson's." It's a rather nice looking clan I might add. So...like I said Spence got married this weekend and it was a beautiful wedding. I've never seen him so happy in all my life. We were all together two weeks ago, but two major things have changed since then. 2. During Christmas you could not tell Nichole was pregnant....this past weekend, I was able to experience the cutest pregnant person in my entire life! How exciting it is to have a family member pregnant. Nichole looked adorable. Not to mention Walt and I are going to be expecting a NEPHEW! Obviously we have grown... we have now become the Wilson-Graham-Bass-Morris Clan...isn't it fun getting older? I don't have much to say in this blog. Walt leaves Friday for 5 weeks... or 35 days, or 840 hours. He's going to Australia...yes, I'm jealous, but I will keep you posted. I am posted a couple pics from the wedding..and some from the ice storm we had in December. Remember we were out of power for like 5 days? But anyways.. here's to growing older, becoming aunts and uncles and expanding the "clan." Walt acting like a child...love it! Me and my handsome husband!